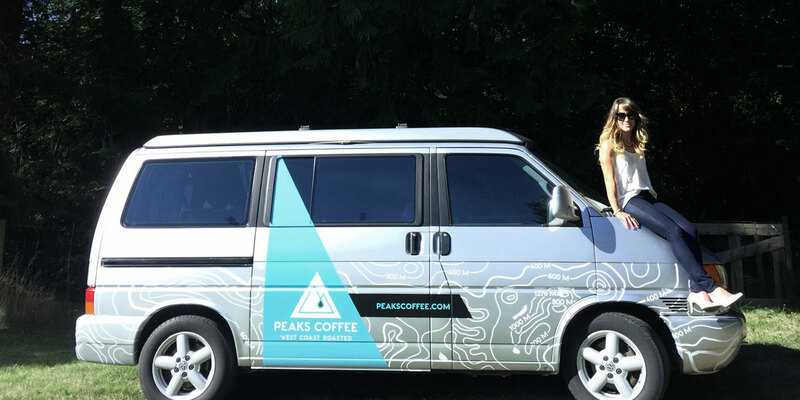 Brandnetic was enlisted to rebrand Peaks Coffee – a Vancouver Island coffee roaster looking to revamp their look, increase retail sales and launch an online store. Looking to evoke the rugged nature of the Seymour range that overlooks the Cowichan Valley, Brandnetic set to work to develop an identity that was both contemporary and easily recognizable. A clever icon and a straight-forward wordmark solved legibility issues of the previous logo, and colorful labels helped the labels pop off kraft coffee bags. We also took the opportunity to develop new blend imagery with memorable icons for each blend. An outdoorsy theme shaped new blend names and copy as well. Brandnetic Studios was tasked with evolving the brand with professional, clean identity system to compete with bigger brands. This is their story. Sales have increased steadily since the re-brand occurred. The greatest increase is in the more urban area stores. The consumers there were excited for the biodegradable high barrier option. The new packaging wasn’t just for show – it was now 100% compostable leading to a completely sustainable product built from sustainable and renewable resources. Our social media efforts lead to more than doubling the overall followers of Peaks Coffee social media accounts, and significantly more engagement from the current and increased audience. Peaks Coffee wanted to reach a wider audience, and with coffee sales online reaching new heights, they needed a new website and online store that could encourage sales of their brand and flavours. Brandnetic built the brand, designed a website around the brand, and executed the online store where each year they reach a new record in sales volume. The rebrand was timed to coincide with the renovations occurring at the roastery. The goal was to design a brand that highlighted that “West Coast” feel, and really stand out in a crowded market. It was also designed to appeal to coffee-fanatic Vancouver Island, and really stand out in a market crowded with choice. Brandnetic needed to deliver a consistent experience across all platforms and products. This meant not only desiging a cohesive web experience that matched the label branding, but ensuring where the Peaks Coffee Company logo was found, it was presented within a consistent framework. This rebranding included renaming blends to match the west-coast branding, copywriting for all products that gave the west coast vibe, and all stationery design (business cards, letterhead), marketing materials (such as mail-outs, pamphlets), vehicle branding, signage, thermos wraps and more were all on point with the brand.